Thermal Arc, St. Louis, MO, has launched the first in a series of multi-process, fully integrated portable welding machines designed to take on many gas-metal-, shielded-metal- and gas-tungsten-arc welding applications. 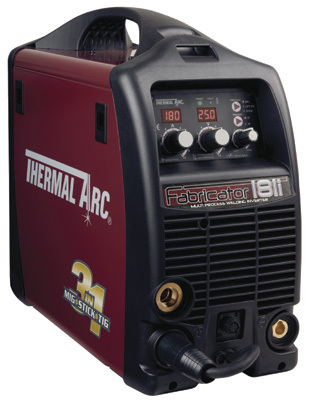 Its introductory Thermal Arc Fabricator 181i system is a portable powerhouse that delivers 180 A of welding output power. Weighing less than 33 lb., the compact machine optimizes portability. It’s ideally suited for light fabrication, maintenance and repair welding and educational training. Included is a detailed weld setup guide for optimum welding performance over a range of materials and shielding gases; digital meters with preview; infinitely variable voltage control; metal feed plate with quick-change drive rolls; and a receptacle for connecting remote-control devices or a spool gun. See also: Victor Technologies Group, Inc.